To date we have identified more than 75 different brands of vintage steel kitchen cabinets manufactured and sold back in the day. Today, a look at some photos of a brand we rarely see, these 1952 Palley cabinets were found on the Pittsburgh Craigslist. Just removed original 1952 steel kitchen cabinets. One coat of paint (visible surfaces) since original paint. Virtually no dents in visible areas. You haul away…best offer. Mega thanks to Craigslist seller Eric for letting us feature his photos on our archive — we hope this rare set finds a new loving home. See our Kitchen Help / Steel Kitchens category. We have lots of information. I’m looking for metal cabinets. Would love any and all advice 😉 I’m hoping to purchase a sink and cabinet that was my grandmas and sold with her house. Jill, we have a story on this. See the top of the Kitchen Help / Steel Kitchen cabinets category page for the story. 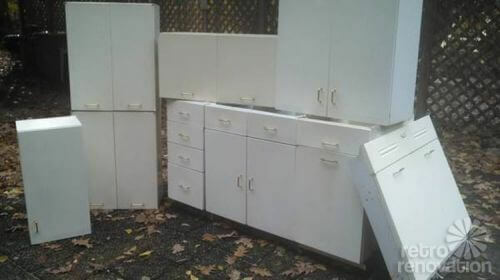 I just bought a set of Palley cabinets off craigslist. Original to the home built in the 1940’s. I have the tall pantry, 2 wall cupboards, 2 bridge cupboards, 2 bottoms with the sink front. I paid $200.00 for all. They are yellowed and need a good gloss white paint job. Overall though it was a great find. I was happy the sink base was just the front. My water meter is under the kitchen sink so I don’t have to cut out the bottom.